Are Guarantor Loans an Option? Central Coast Home Loan Warehouse / Are Guarantor Loans an Option? Ever wondered why buyers with small deposits still use guarantors? So you have saved your 5% deposit and you’re getting ready to purchase your first home. You have heard about lenders mortgage insurance. 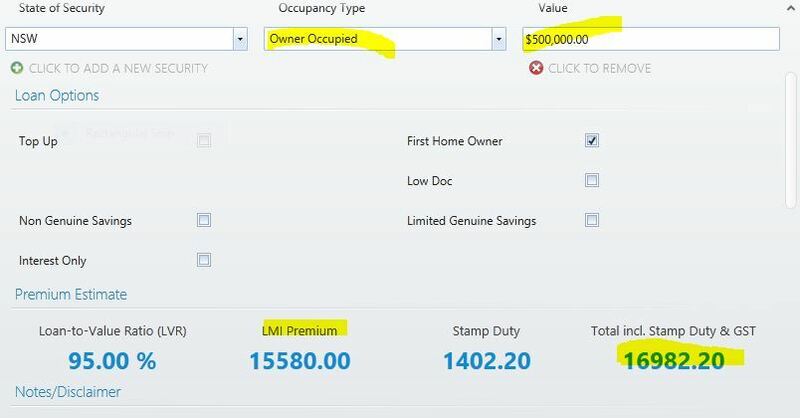 You know it can be expensive but could it really be that expensive that it actually makes buying a home out of the question. In this article we will have a look at exactly how LMI or lenders mortgage insurance works and why some borrowers use a guarantor even when they have saved a full 5% deposit. A guarantor is simply someone who agrees to settle a loan of the borrower in case they fall into default. The terms and conditions require the guarantor to provide their house to act as security for the loan. This in turn lowers the lending risk qualifying the borrower to secure a loan amounting to 100% of the buying price. Bank fees (lmi) without guarantor. Assumes $500,000 with 5% deposit. The question of who can be a guarantor largely depends on the lending policy of various banks. Some banks only allow the guarantor to be the borrower’s parents. This is referred to as family pledge or parental guarantee by some banks. This kind of arrangement is preferred by most banks as there is a mutual relationship between the borrower and the guarantor. The guarantor is also well aware of the financial capability of the borrower. Most guarantors would not associate themselves with financially unstable borrowers knowing that the guarantee could be called upon. Nevertheless, there are some banks that could allow other members of the family provide the guarantee. How a guarantor is different? Contrary to co-applicant or co-signer, the obligations of the guarantor on the loan may be terminated provided the guarantee is lifted. This may happen given that the guarantee is limited to a section of the loan or because certain conditions are met. This means that the guarantor’s obligations cease to exist under the arrangement and the remaining debt now lies to the borrower. Just like some banks have imposed rules on who can become a guarantor, there are also certain requirements on the type of security property that can be offered by the guarantor. A property with no existing mortgage is viewed by major banks as a more suitable security type. This is because in an event the borrower defaults, the bank would have the first priority in securing their funds. However, each bank has got its own restrictions. The majority of people who become guarantors are parents as they try to assist their children acquire a home. This is generally because their kids have not saved for a deposit. Such a guarantee from a parent means that they are eligible to borrow 100% of home purchase price. This is a great assistance to those who have not saved enough deposit to acquire a home. How can the guarantee help? A guarantor loan enables the borrower save thousands of dollars as you do not pay the Lenders Mortgagee Insurance (LMI). With a guarantor loan, you are not required to pay the LMI which is usually applicable when acquiring loans that are beyond 80% LVR. A guarantor can apply for their guarantee to be removed given that the borrower has enough equity. However, some fees may apply and so it is advisable to ensure you have met all the requirements before the guarantee can be released. How a guarantor loan works When a home is purchased using a guarantor loan, that property is used by the banks as the primary security. However, guarantors also offer their property as additional security for the loan borrowed. Doing this, a guarantor is liable for repaying the loan given that the borrower defaults on the loan. Becoming a guarantor can be risky provided the borrower cannot manage their finances properly. This is because if the borrower defaults in paying the loan, the guarantee would be exercised by the bank to cover the debt. Thereby, it is advisable that you seek legal advice on your position as a guarantor. It is also essential you ensure that the borrower is financially stable to make consistent payments towards the advancement of the loan. This will in turn greatly reduce the risk of the burden falling on you.